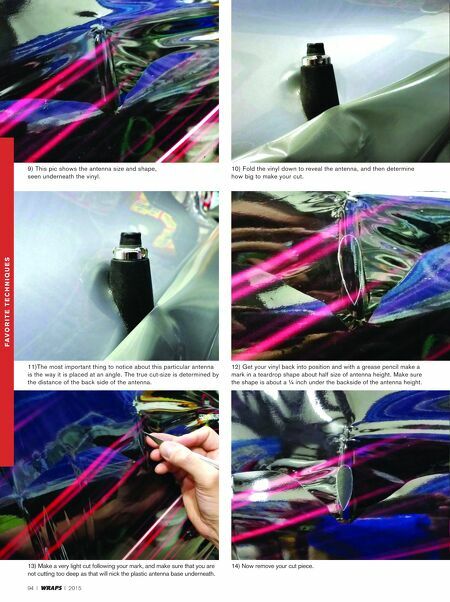 94 I WRAPS I 2015 F av o r i t e t e c h n i q u e s 9) This pic shows the antenna size and shape, seen underneath the vinyl. 11)The most important thing to notice about this particular antenna is the way it is placed at an angle. The true cut-size is determined by the distance of the back side of the antenna. 13) Make a very light cut following your mark, and make sure that you are not cutting too deep as that will nick the plastic antenna base underneath. 14) Now remove your cut piece. 10) Fold the vinyl down to reveal the antenna, and then determine how big to make your cut. 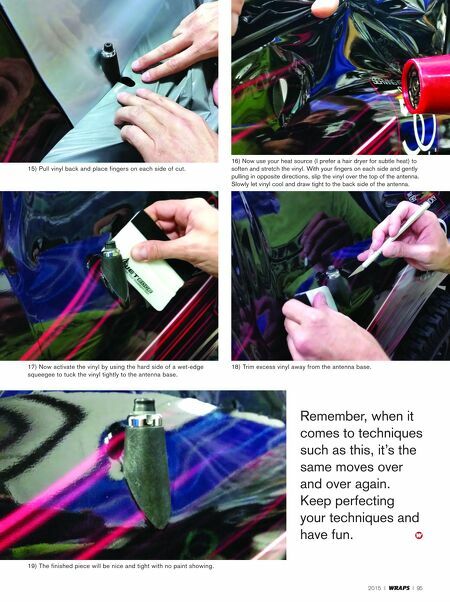 12) Get your vinyl back into position and with a grease pencil make a mark in a teardrop shape about half size of antenna height. Make sure the shape is about a ¼ inch under the backside of the antenna height.